Adam Gerondis’s grandfather opened Australia’s first milk bar in 1932 and the lineage shows. Moo Burgers at Bondi Beach and Coogee combine history and earty fare in retro outfits. With names like Little Cow for the kids and Big Moo burger piled high, they don’t take themselves too seriously. Tell us a little about who you are and how Moo Gourmet Burgers started? My name is Adam Gerondis and I am the Founder & CEO of Moo Gourmet Burgers, our first store was established in Bondi Beach in 2009, at the time the only burger option was one of the fast food chains. I saw a market for good quality old fashioned gourmet burgers , and MOO was borne. We wanted premium quality and ethically sourced produce from the beginning, we went with the classic milk bar style beef burger and built the menu from there to include a range of 20 gourmet burgers, using free range and ethically sourced meats, the menu now has a range of beef, chicken and vegetarian burgers and a few more unusual ones like kangaroo, Greek lamb and duck and bacon. Speaking of burgers… What kind of burgers do your locals love? 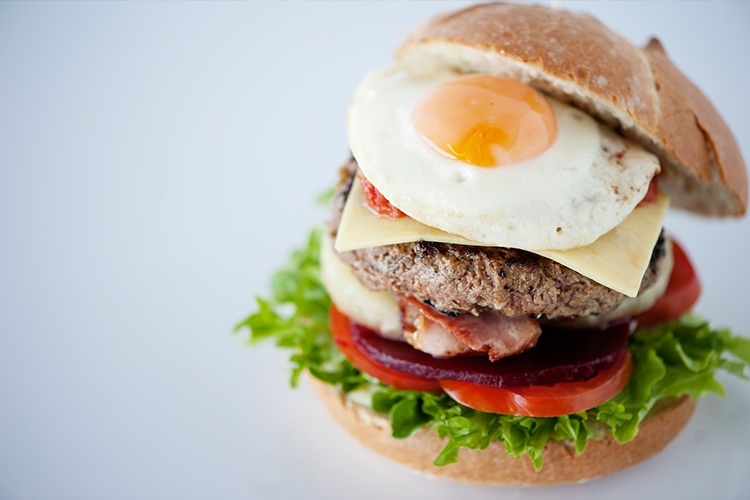 Given our location – the amazing Bondi Beach – we have alot of tourists and they really like to try the kangaroo burger! We have limited edition burgers from time to time, some of them are so popular they end up on the menu and others don’t quite make it, like the Goat Burger we tried out and wasn’t so popular, we also try out a few different burgers over summer for people that want something with a lighter refreshing taste. We love Birichina Café, it’s just around the corner on Lamrock Ave and has the best coffee in Bondi and a great chilled Bondi vibe. Anita Gelato opened recently on Campbell Pde and its hard to stay away! So much to love about Bondi, the people, the beach the view and the vibe, it’s still got that feeling of an old fashioned beachside neighbourhood but with international standard cafes, restaurants an of course burgers! Have you been to Moo Gourmet Burgers? Tell us what you think and write a review.